Landscaping lasers can create amazing effects in an instant, impressing neighbors and friends with just one device. 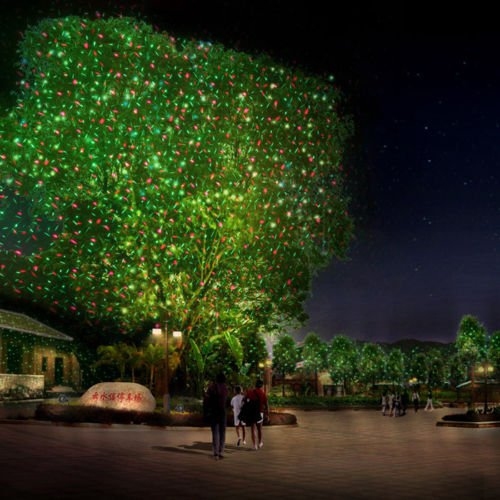 The most common lasers built for landscaping feature a wide reach of tiny pinprick lights sometimes referred to as firefly or sprite lighting that can create magical effects using low voltage that you have to see to believe. Below are some quick and easy ways to make your yard sparkle. Outdoor lasers like these can come in a variety of colors and features. Most are stationary and project one color, but it’s common for more expensive models to have dual colors, rotating movement, pulsing patterns, and shutoff timers. The possibilities are endless, but prices can range from as little as $60 to $300, so think about your budget and decorating needs to make shopping easier. For the biggest wow factor, choose green. The human eye is more sensitive to green wavelengths so green lasers look brightest to us and naturally stands out, plus it can easily pair with your yard’s foliage and color scheme. All laser colors are vivid and bright, but when pairing different colors, keep in mind the unique intensity of green, as it will always stand out more than the other colors so plan accordingly. Blue is a good color if you want a magical, almost mysterious look to your design. It feels very ethereal and subdued compared to other choices. Red will be the dimmest choice as the wavelengths are the weakest, but it’s still a strong color that can add warmth to your yard. Outdoor lasers usually feature stakes so you can easily plant the device in the ground and have an adjustable head to get the perfect angle you need. Be careful though, lasers will continually project in their adjusted direction, so keep them below a 45 degree angle to avoid interfering with air traffic. As with all lighting effects, ambient lighting from streetlights, decorations, and windows will diminish the laser’s effect. However, by its very nature lasers are highly focused beams of light and will still be visible during full daylight so don’t be too deterred if you live in a brightly lit neighborhood at night. Simply choose a primary focal point for the laser and plant the device close by. No matter the distance of the device, the intensity will always remain the same, so feel free to experiment when you’re figuring out where to place the device. The easiest focal points for lasers are trees and other large foliage. These are perfect candidates because the subtle movement of their leaves in a breeze will move through the laser’s projection and give the impression that the lights are sparkling as they hit different points. If you don’t mind the occasional pinprick of light through your windows, point a laser at your house from a distance. Even large dwellings can easily be covered in the firefly light of the lasers and when paired with other decorations, it can create an amazingly complete look for the holidays and parties. Since laser lights are focused, there is no residual light that can spread out and annoy nearby neighbors. This makes it perfect for adding a huge touch to your home that will have a minimal impact for those around you so you can use them every day or for outdoor parties. Remember to get creative with your lights! Try placing them inside plants or accent different areas of your yard in different colors. Overlap colors to create different moods or heighten the energy of an outdoor party. Landscape lasers are also safe to use indoors as well, so feel free to bring them inside for special occasions. Server responsed at: 04/23/2019 12:56 a.m.